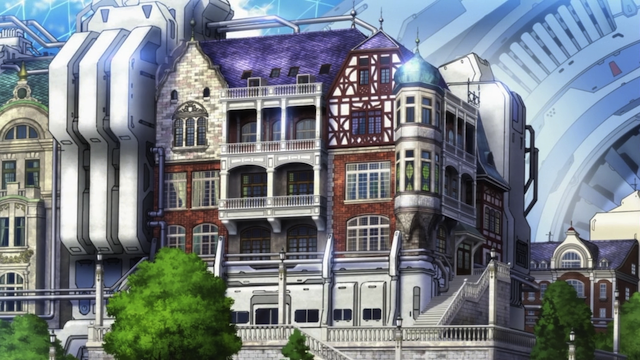 I think this is an exterior of the building that serves as the home base for AKB0048. It is a very interesting mix of styles. 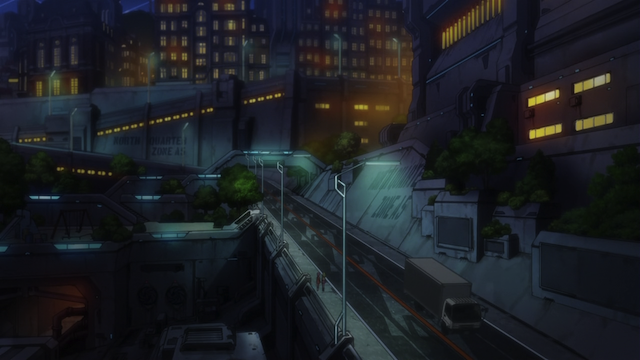 In the background you can see that the city is under a dome of some sort. From this angle, it is easy to see that the large structures are holding up a glass dome. Notice that there are no roadways. The only apparent modes of transportation are walking and some sort of “water train” (barely visible, in the upper right, as it heads under the bridge). This shot shows the “water train” clearly. 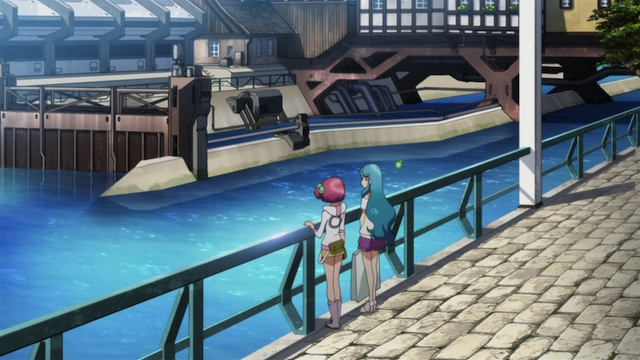 Nagisa and Chieri are talking across the river from what looks like a “water train” station. Notice that the structure across from them is designed to allow a watercraft in at one side and has a gate on the other. As beautiful as the other shots were, it was the last one (the water train station) that really got to me. It is obvious that a lot of thought went into filling out the ideas for the world in which these characters live. 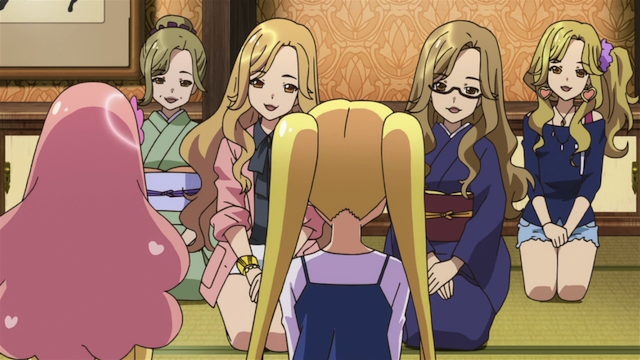 Akabaster is VERY different than the home world that Nagisa and her friends come from, which was sooty, and dark. 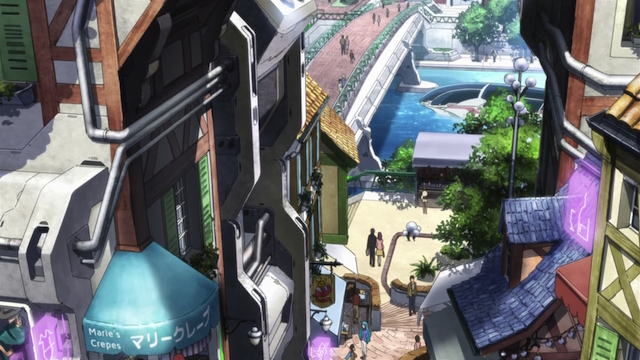 Akabaster is also meticulously planned, while still being organic (of example the streets wind about, and there are different levels — streets aren’t flat and on a grid). I like the way the streets are constructed with paving stones and brick, instead of asphalt; it gives the city an old world feel, even while they are surrounded with futuristic technology. Akabaster at night. Trucks are seemingly allowed outside of the residential districts. If you look closely at the walls next to the roadway, you can see that they indicate the district that you are passing by. Also the only automobile visible is a truck, so they are probably used for delivering products, not people. Are you ready? If so, good. The original Itano Tomomi (“Tomochin”) performs “Clone”. Generation after generation of Tomochin. Of the three mysteries, I think this one will have the least impact, since most successors are not blood-related. It does start to open the door a bit on what exactly is meant by succeeding a former member. Here genetic material and the “Laws of Tomochin” both go into re-creating the successor. On a side note: Tomochin the Ninth is only the second character that I noticed who does not have heart-shaped highlights in their hair and eyes. Both the ex-Tomochin and ex-Mariko (the manager, Tsubasa Katagiri) have diamond-shaped hair and eye highlights. 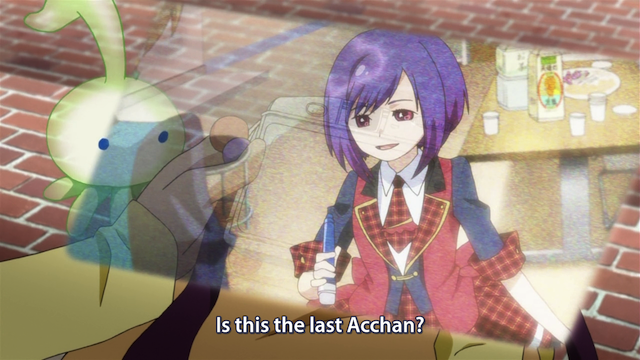 Acchan, like every Center before her, disappeared under mysterious circumstances. The mystery about the disappearances of girls who previously held the Center position, but left AKB0048 seems more likely to have plot impact. At the very least, there was a lot of discussion about how the position has been eliminated since Acchan left. Yuuko Oshima aims to bring back the position (and fill it herself). All of 00’s lyrics and publications are credited to the same name. 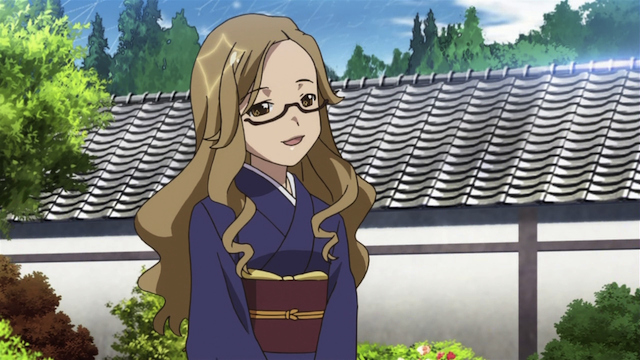 And finally we get the mystery surrounding Sensei-sensei. 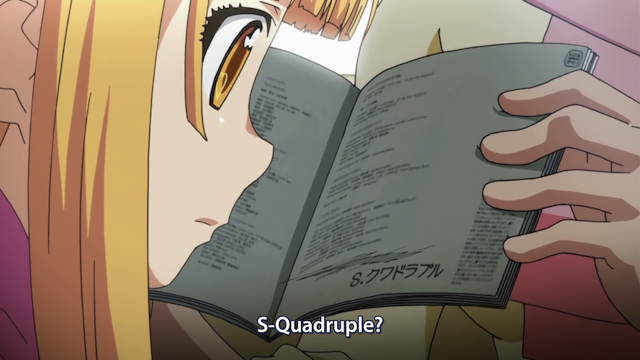 My guess is that Quadruple-S is actually some sort of artificial intelligence, or possibly a brain in a vat. 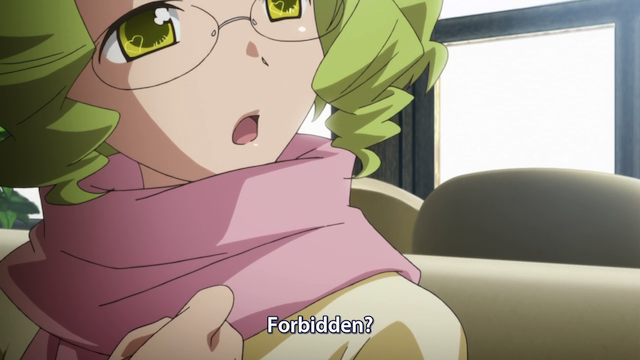 Either way, it is some disembodied consciousness that guides AKB0048 as a replacement for Yasushi Akimoto. I am most interested in this aspect of the show (after the combat concerts), so I hope this becomes a big part of the series going forward. 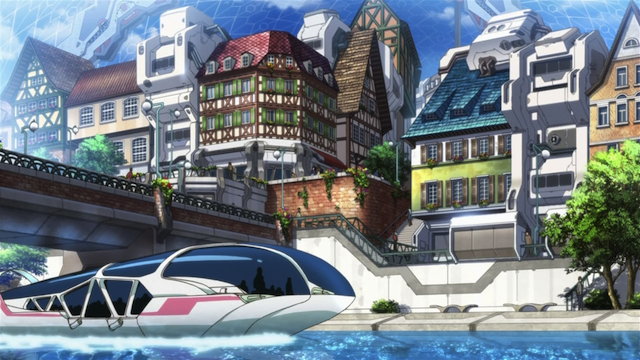 I still like the suggestion I read somewhere that Akabastar was a big Macross Frontier style space city, hence the domed architecture. 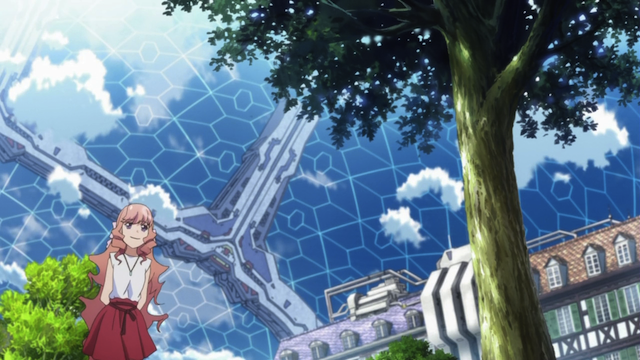 The connections between Macross and AKB0048 are significant, and, I think one of the important factors in making this show work. 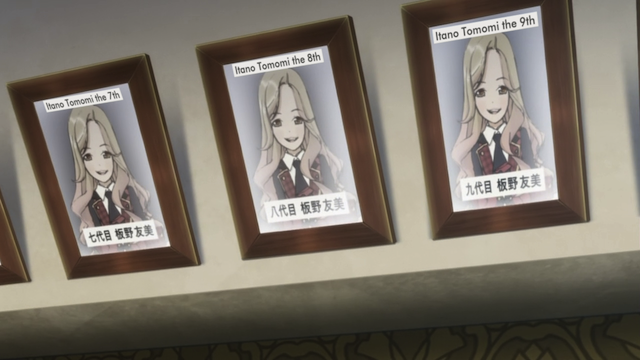 I lol’ed so hard at all those Tomochin’s. Can’t believe they actually took her song seriously and Tomochin trade mark duck lips~ No AKB songs in this episode though. Acchan disappearing, wonder if it has to with the actual Acchan’s graduation announcement. In some ways this was the most interesting episode for me, because I was wondering what point they were trying to make about the graduations and laughing at the inside jokes about Tomochin.